Portland fries come to Alberta! Add potatoes to a heavy bottom skillet. Pour oil over the top. Oil should just cover the potatoes. Cook over medium heat until oil bubbles. 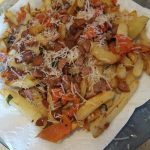 Allow to cook for 5 minutes or until the outside of the fries become firm. Stir the potatoes. Continue cooking for 15 - 20 minutes or until fries become golden brown. Stir occasionally while being careful to gently scrape any that stick to the bottom of the pan. Once fries have started to turn golden brown, add sage and rosemary. While fries are cooking, brown chorizo in a pan until warmed through. After fries and herbs are golden brown and crisp, use a slotted spoon to transfer to a paper towel lined plate. Immediately sprinkle with salt and pepper. Transfer fries to a serving platter. Scatter chorizo and peppers over the top. Sprinkle with Parmesan cheese. Serve immediately. © 2016 Winter's Turkeys. All rights reserved.